Welcome to Abbey Fireplaces where we specialize in the most modern, efficient and reliable wood heaters, gas fireplaces, electric and spirit fires as well as a comprehensive outdoor heating and cooking range including pizza ovens and quality barbecues. We carry the largest product range in Australia and have highly qualified staff in each showroom to guide you through from design to installation. A fireplace is a centerpiece of every home and at Abbey Fireplaces we pride ourselves on offering the most cutting edge technology and expert advice right through the specification, design and installation process. 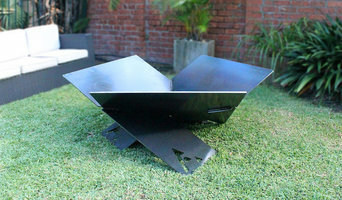 Bespoke outdoor fireplace / fire pit.Handcrafted in Sydney by local metalworker Dean Roach.The Firepod is perfect for innercity living - a sculptural and functional addition to your balcony,backyard,or courtyard. Also great in the warmer months as a beer/wine cooler , oil burner, or with candles inside for lighting effects. The Firepod comes with legs or may be suspended using s.s. wire or chain. Free delivery in the Sydney metro area. 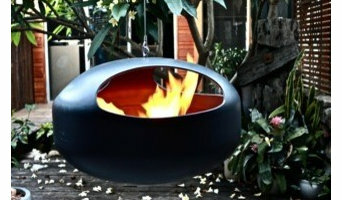 Feature Fire is a boutique design firm specialising in the design of custom fireplaces and fire pits. Our fires are designed to be artistic, sculptural, functional and SAFE. Our Fire Pits are an innovative project challenging the traditional notion of fire pits. Three identical pieces of laser cut sheet steel interlock one by one to support each other, creating a cantilevered sculptural form free of welds or bolts. The open triangular design creates the perfect form-work for lighting a fire, allowing it to draw air from underneath to create a hotter fire with less smoke. Made from laser cut mild steel, Our Fire Pits are designed to naturally weather and corrode to establish a bronzed outer layer of rust while maintaining structural integrity for a lifetime of outdoor enjoyment. We can also produce custom fire pits and products from Mild Steel, Stainless Steel and Aluminium Alloys! 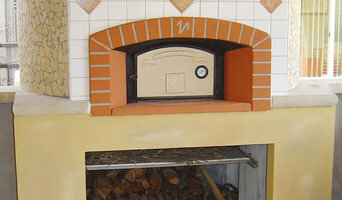 Vesuvio Wood Fired Ovens, an Italian-Australian family-owned and operated company based in Sydney NSW, now brings the finest quality wood fired pizza oven range to Australia. Valoriani ovens, originating from Tuscany, Italy and expertly crafted by the Valoriani family with over 50 years’ experience are only exclusively distributed in Australia by Vesuvio, making them market leaders for both residential and professional wood fired ovens in the country. Vesuvio is operated by a dedicated team of professionals, passionate about this simplistic and wonderful way of cooking, with many years’ experience using wood fired ovens and knowledge of wood fired cooking. In addition to wood fired ovens, Vesuvio are also authorised dealers of GI metal tools and accessories for the pizza industry. From aluminium or stainless steel pizza peels, wood fire oven cleaning brushes or pizza screens and trays. GI metal are high quality and durable enough for even the highest production pizzerias. The Vesuvio Wood Fired Kitchen is also the perfect location for intimate, hands-on cooking classes. From pizza to meat, seafood and vegetables, Joe Cassisi, internationally accredited chef, conducts a range of classes where he shares all the tips and tricks of the trade. Vesuvio are dedicated to professional yet personal service for both residential and commercial customers. We are a locally owned and family operated business specialising in an extensive range of wood and gas fireplaces. We have over 30 years of experience and can organise everything from supply of your new dream fireplace to a complete installation. We supply to the public and also offer trade discounts and packages for builders and trade suppliers. The Heater Man specialises in the service, repair and installation of gas appliances, such as portable gas heaters, gas fireplaces, hydronic heating and gas hot water systems. We offer a complete end-to-end service helping customers choose the right heating system for their homes. Our showroom has working display models of several brands of gas fires and portable gas heaters, and our trained staff can help you choose the best product for your home. Portable heater services are performed in our Rozelle workshop through our ‘drop & go’ service - just drop and go, no bookings required. Alternatively call our bookings team for a service in your home. Call 02 8866 3560 for enquiries relating to sales, service or the installation of your next gas fire or heater. atmosfire brought together a great variety of fireplace and wood heater designs, smart installation ideas, showrooms, installers, firewood suppliers and a host of other useful and interesting information. Jetmaster as market leaders pride ourselves in customer service and a commitment to offering you the best in gas and wood fire technology. Jetmaster is used and recommended by all the top builders and architects including Metricon, Masterton, Multiplex, Mirvac, AV Jennings to name just a few. When Jetmaster was first introduced into Australia in 1980 it basically revolutionized the open wood fireplace market. Ever since, Jetmaster fireplaces have been the standard across Australia. Sydney Heaters is one of the leading names when it comes to selling heaters and pizza ovens in Australia. 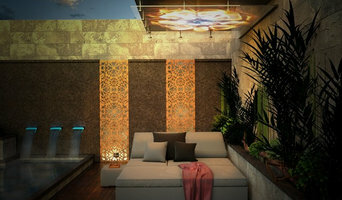 You will see a lot of companies selling different types of heaters like gas operated heaters, wood operated heaters, other heaters with different styles and designs. But the products offers by Sydney Heaters are exceptional. Over the past 25 years, we have created a niche in this market segment. Pizza Ovens are among the best that you will find anywhere, and moreover heaters and ovens make cooking an extremely easy task. Fireplace designs vary, whether you are looking for a minimalist gas fireplace or a large outdoor fireplace. Hearths and fire pits can transform your backyard and offer an entirely new focal point in your Sydney, New South Wales property. Really feeling original - try a chiminea! Chimineas bring the warmth and ambiance of wood fireplaces to any outdoor entertaining area. What Should You Know About Buying a Fireplace? Since wood smoke contributes to air pollution, many cities have banned the use of wood-burning units. If you’d like to buy a wood burning unit, check the Sydney, New South Wales city policies first. If your home already has a wood-burning unit that you’re concerned about, contact a fireplace manufacturer to replace your wood-burning unit with an environmentally friendly electric or gas alternative. Gas inserts can be efficient heaters and may lower your electric-heat bill. Many adjust to provide high heat on a cold night or a low-burning flame for ambience. Interior fireplaces and mantel designs are as varied as home interiors. From custom fireplace mantels made to conceal a flat-screen TV to custom hearth designs with elaborate Renaissance-style stone mantels, the latest designs can be found by visiting Sydney, New South Wales fireplace showrooms. Outdoors, a custom fire pit has become an important focal point and gathering place. Decorative fire pits, artisan-made fire bowls and even fire tables come in many shapes and sizes and are fast becoming an integral part of landscape designs. But whether indoors or out, it can be hard to narrow down all of the incredible choices in fire features. You may want to hire a designer to help you find the perfect size, style and placement for your new fire element. Here are some related professionals and vendors to complement the work of fireplaces: Building Project Managers, Interior Designers & Decorators, Stone, Pavers & Concrete, Tile, Stone & Benchtops. Find fireplace manufacturers and showrooms, plus fireplace installation professionals, on Houzz. 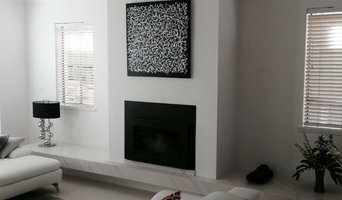 Go to the Professionals section to find Sydney, New South Wales fireplace design and installation experts.